With Action Comics, Detective Comics and Batman being renumbered as part of DC's September initiative, that leaves Marvel's Uncanny X-Men as the longest-running uninterrupted title in comics. This morning, Marvel announced to the Associated Press that as a consequence of the events of Jason Aaron's X-Men: Schism event series, the stalwart Uncanny X-Men will end as of October's #544, giving the crown of longest-running uninterrupted title at the Big Two to... Vertigo's Hellblazer, of all the unlikely winners.Speaking of the change, which will no doubt lead to a bevy of new X-Men titles, current Uncanny X-Men writer Kieron Gillen said that "if the story we're telling demands that you end the 'Uncanny X-Men,' you end the 'Uncanny X-Men.' No, it's not taken lightly - but it's taken if it's necessary to do it." X-Men: Schism will feature Scott "Cyclops" Summers and James "Wolverine" "Logan" "Patch" Howlett having an ideological disagreement in the wake of the return of Quentin "Kid Omega" Quire, the nihilist mutant punk from Grant Morrison and Frank Quitely's "Riot at Xavier's" arc of New X-Men. He will presumably do something Very, Very Bad, which will lead to the confrontation between the two popular characters. Commenting on Twitter, Gillen humorously stated that "When I joined Uncanny after S.W.O.R.D. I thought 'There's no way I can get THIS cancelled'. But there are no limits to my power." The full cover and details to Uncanny #544 are below the jump. All things must come an end...even for the X-Men, and this October fans will bear witness the end of an era as Uncanny X-Men #544 concludes the long running series. It's all come to this! Years in the making, the seeds of dissent finally bear fruit as the events of X-Men Schism tear the X-Men and the Marvel Universe apart! When the dust settles, the state of mutantkind will irreparably be changed forever. 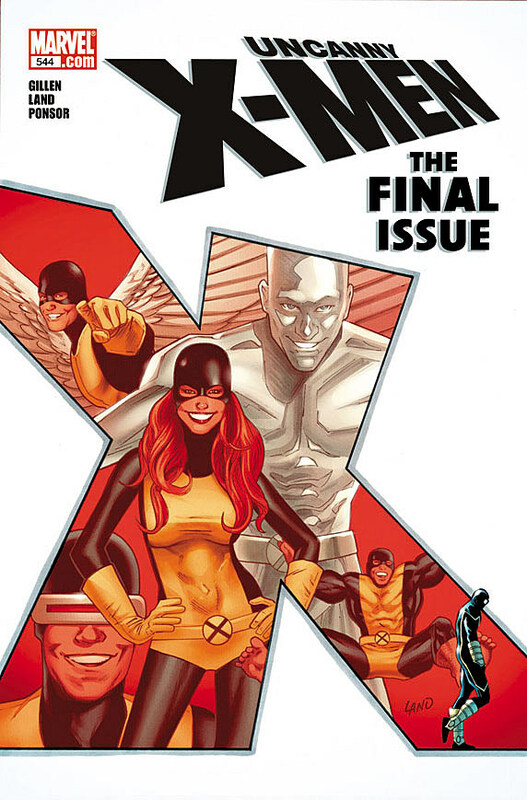 Don't miss the historic final issue of the longest running X-Men title this October, in Uncanny X-Men #544!